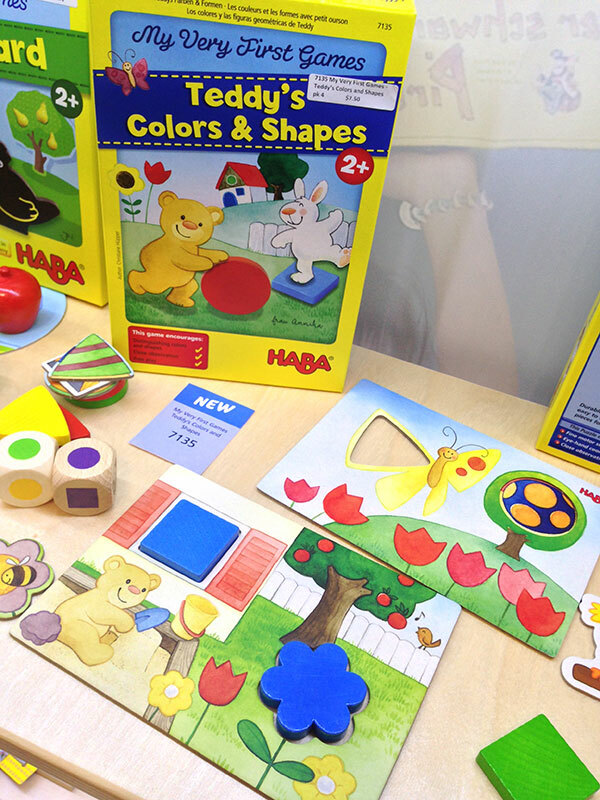 When it comes to children’s games, one of my favorite publishers is Haba. 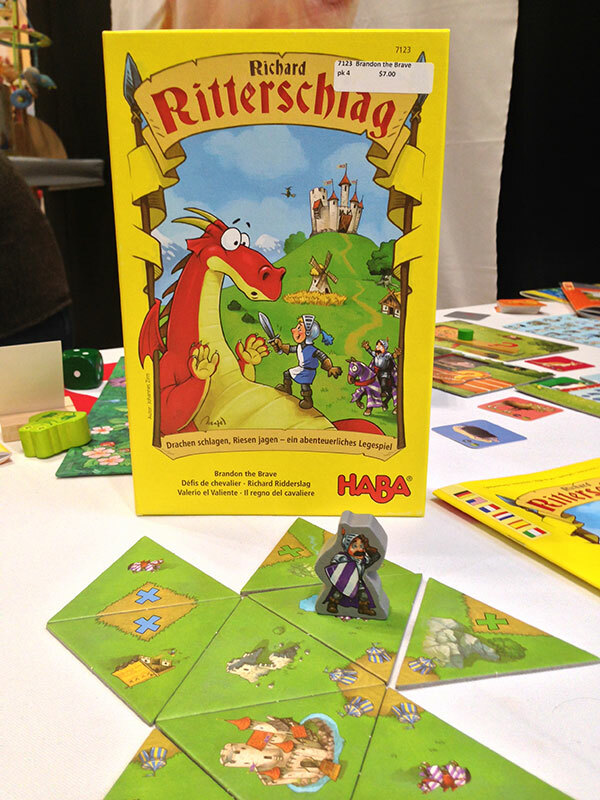 Unlike most game companies that may start at games for six year olds or eight and up, the Germany-based company’s game products start as young as two, yet they have a deep line of games to appeal to older children and adults playing with kids. All games will be available in English or French for the North American market. Everything listed below is either currently available or will be available before summer 2014. 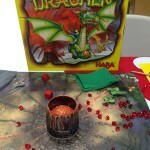 First up, Fire Dragon: roll dice, move your dragons around the board and drop rubies into the volcano. 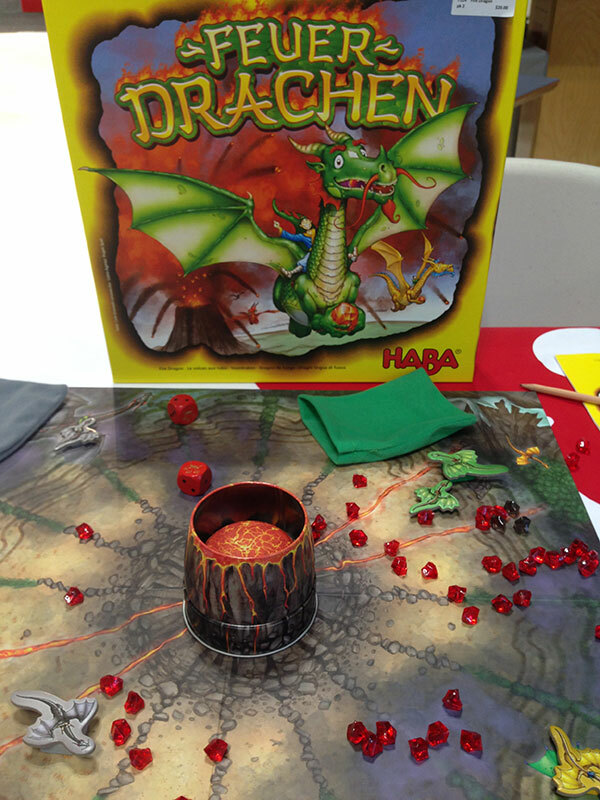 Eventually the volcano “erupts”: a player lifts the tin top off the volcano center piece off, spilling gems across the board. Your dragon flies around the countryside swooping up gems as she goes. Fire Dragon is rated 5+ and will retail for $40. 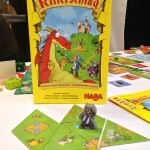 Possibly my favorite game from Haba this year is Orinoco Gold. You’ll need a lot of table space for this one — the board is nearly 40 inches long! 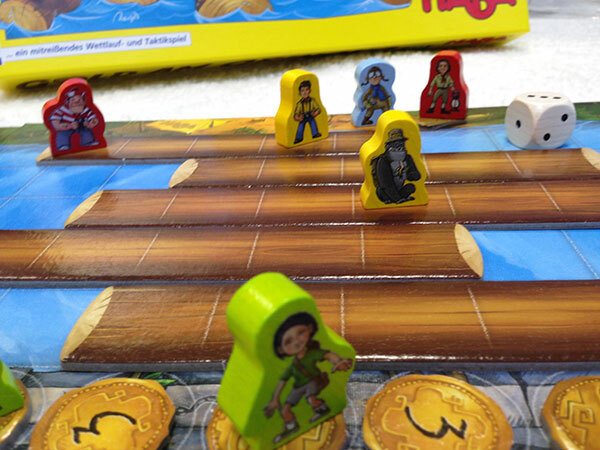 Your team of explorers races across logs that are being swept downriver to grab gold on the far bank and return to their camp. 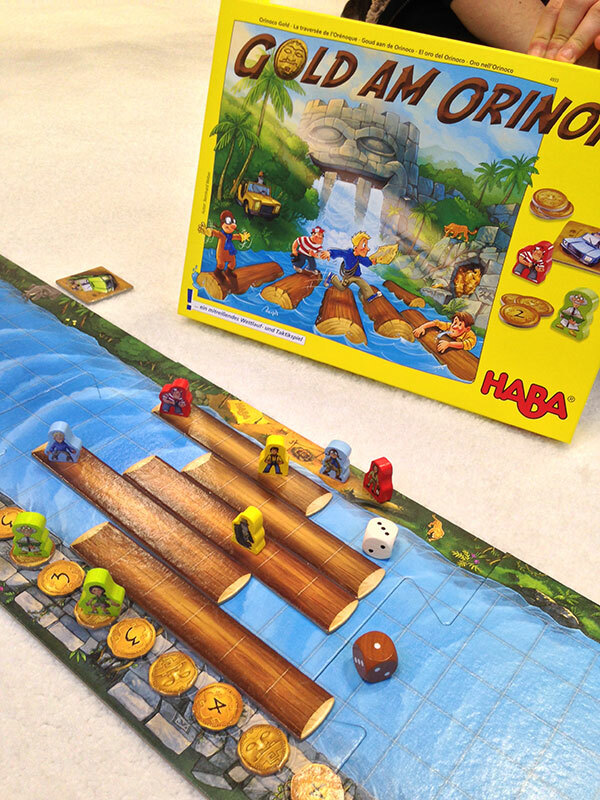 It is a simple dice game that has players deciding who to move and which logs to send downstream and help/hinder their opponents. 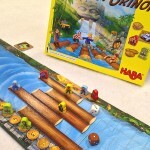 Orinoco Gold is rated for 7+ and retails for $36. But what if you like volcanoes and gold? 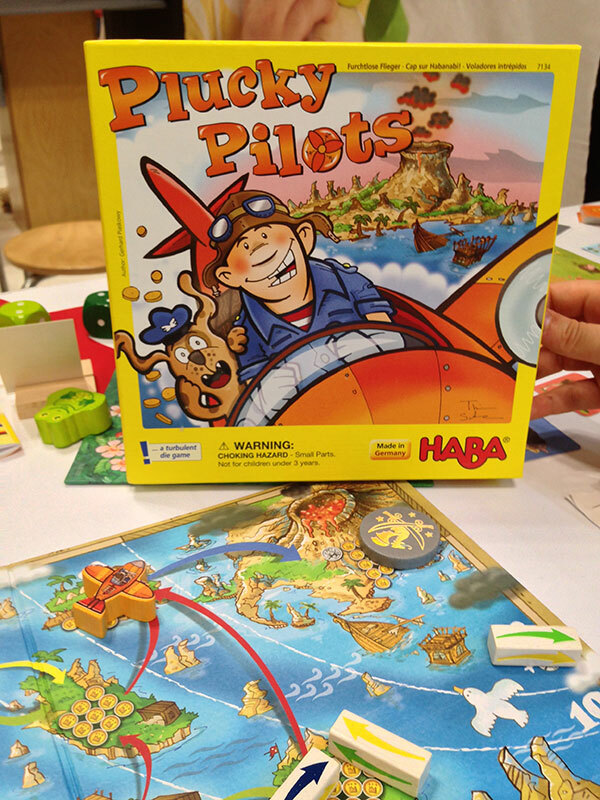 You might want to pick up Plucky Pilots, a game that “is played a lot” at the Haba offices. 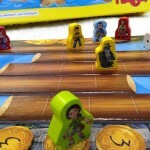 The game is a press-your-luck dice rolling game, with a pilot flying towards a volcanic island where shipwrecked gold coins litter the shoreline! 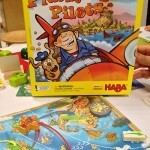 Roll rectangular dice to show which pathways your pilot can fly. Early in the game, you have lots of choices, but as you get closer to the final island, there are fewer routes to take. Stop and bank your gold or continue and possibly lose everything? This game is for 6 and up, and retails for $21. 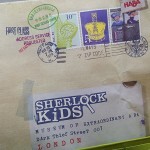 Sherlock Kids is an observation and memory game, with players trying to catch an art thief. Contained in a large, thematic envelope, there are twenty complex paintings. 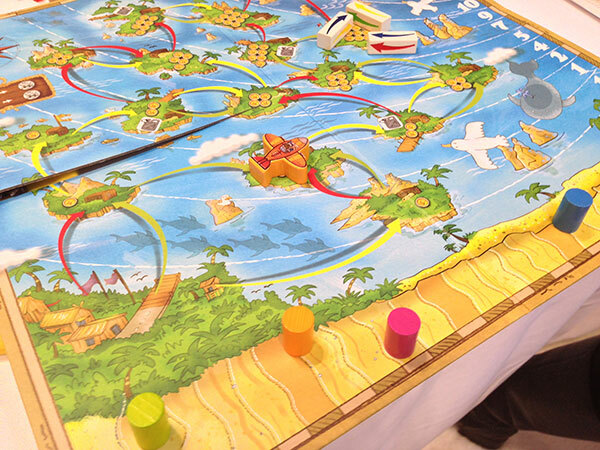 After all players look at the painting (printed on a durable fabric about the size of an A3 sheet of paper), one player covers it and asks a question about it: “How many balloons were there in the upper-left corner?” Using cardboard discs, the others dial in their answers. Those that are right get closer to catching the thief. 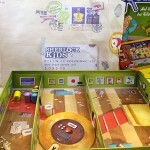 Like many Haba large box boardgames, the box becomes part of the game board. 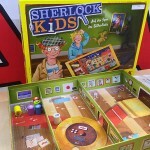 Sherlock Kids is rated for 5+ will retail for $28. This game is currently in stock. 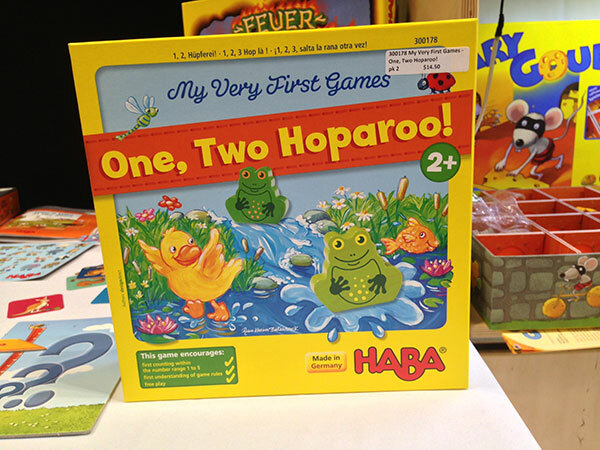 For the younger crowd, Haba debuted several games in the My Very First Games line, all suitable for two year olds and higher. 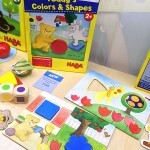 Teddy’s Colors and Shapes ($15) is a shape recognition and matching game. 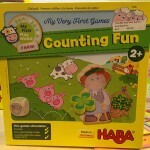 Counting Fun ($29) is a counting game with double-sided farm animal tiles and big, clunky wooden shamrocks. 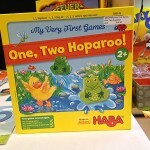 One, Two Hoparoo! 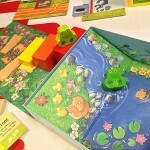 ($29) is a simple roll and move game with frogs hopping towards a pond. 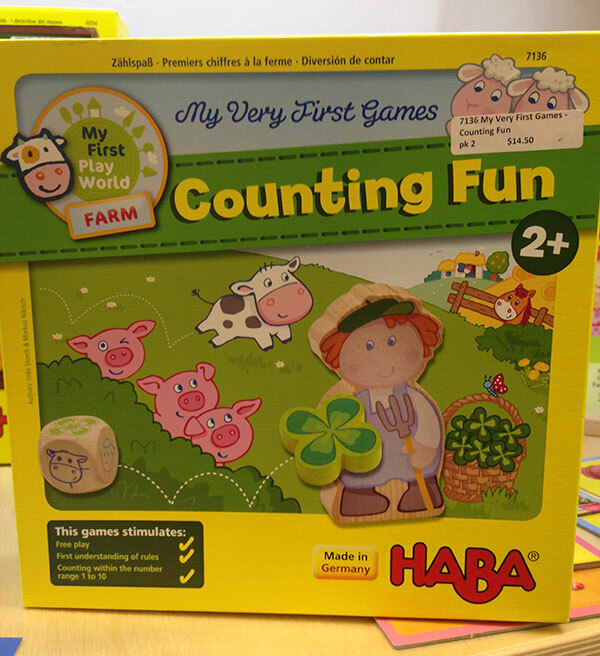 All of these games come with big wooden dice and alternative levels of play to grow with your child’s counting abilities. Also debuting in the My Very First Games line is Lilli’s Favorite Clothes, one of the first games that isn’t in the familiar Haba yellow box packaging. Lilli’s Favorite Clothes (and forthcoming Unicorn in the Clouds, to be released in the fall) will be in pink packaging, which has worked well for marketing in Europe. 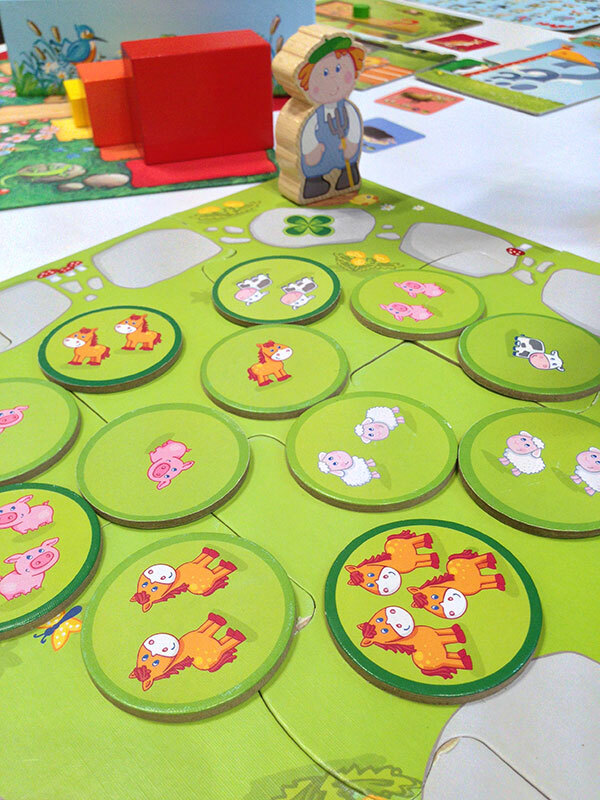 Lilli’s Favorite Clothes has players creating outfits for Lilli and her friends by drawing tiles in a memory game and placing them on the correct friend. 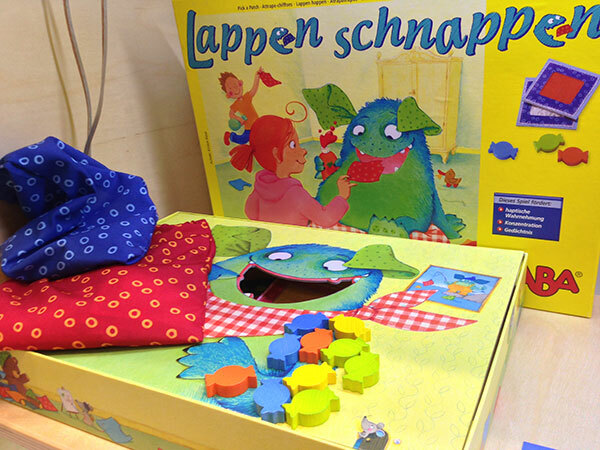 Like the other games in the line, this can be staged up for slightly older children: players can roll dice which dictate which clothing items must be found next. This game will retail for $21. 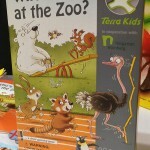 Stepping away from the yellow box packaging is Who’s Who at the Zoo? 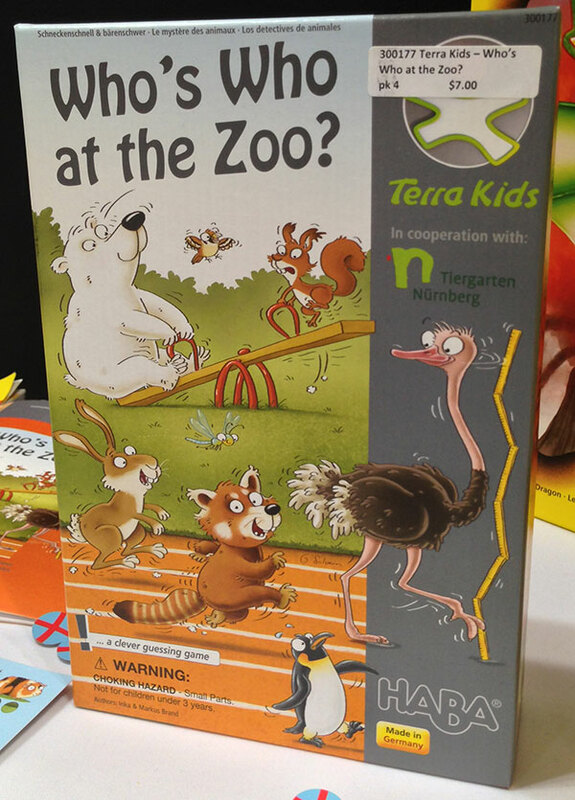 This is the first game packaged in the Terra Kids branding, Haba’s outdoor activity line. 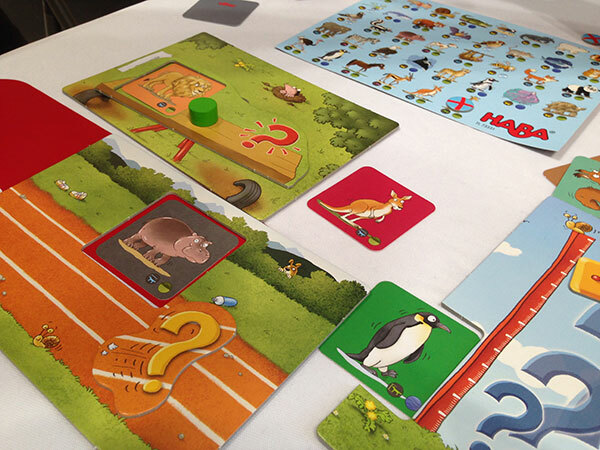 One player selects an animal and the others try to guess it by asking questions about relative speed, size, and weight to another animal. 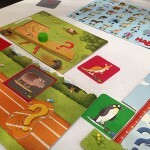 If you aren’t sure if a polar bear is faster than a giraffe, the game book has tables and educational animal facts to help out. This is rated for 6 and up, 3-5 players, and will retail for $15. 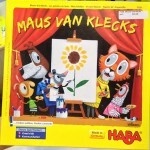 Maus van Klecks (aka Mouse Van Klecks) is a like minded matching game of colors. 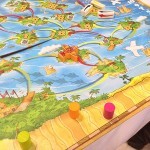 One player chooses a subject and everyone secretly decides which three colors would be used to paint that thing. Reveal your painter’s palette and gain points for matching others. What colors did you choose for butterfly? Blue, red, and orange? 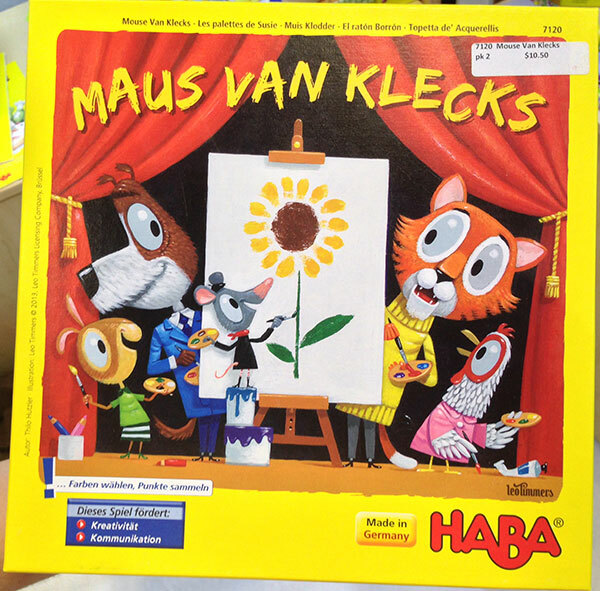 Maus van Klecks is rated for 5+ and retails for $21. 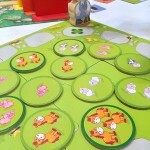 Pick a Patch seems to be a slightly older (ages 3-12 ) version of My Very First Games: Touching and Feeling: a tactile game where players draw matching tiles from a bag based on texture. 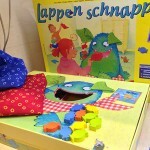 Where Touching and Feeling (ages 2+) uses wooden shapes, Pick a Patch uses textured squares and players get to shove them into a monster’s mouth when they are right. Pick a Patch will retail for $36. 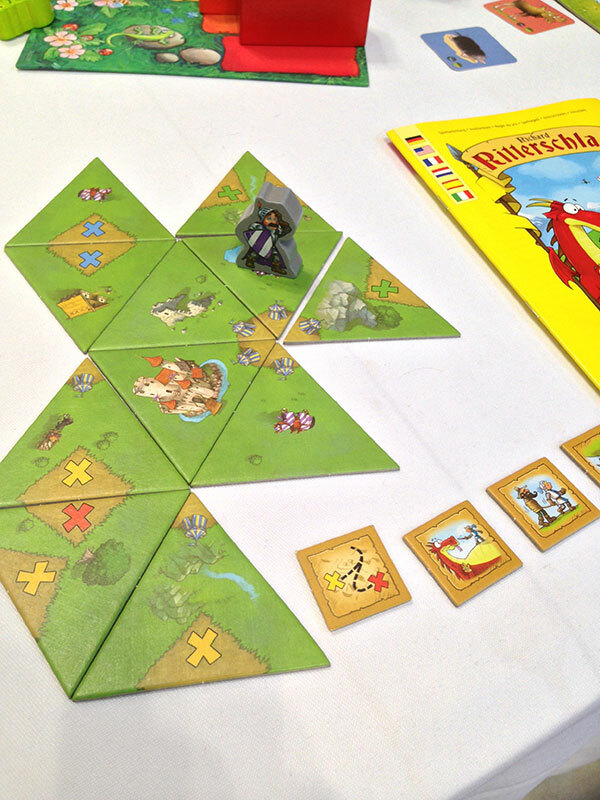 Our last game is Brandon the Brave, where a brave knight completes tasks by placing triangularly shaped tiles to create the countryside. 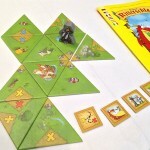 Place tiles in the right order to complete four tasks to win. 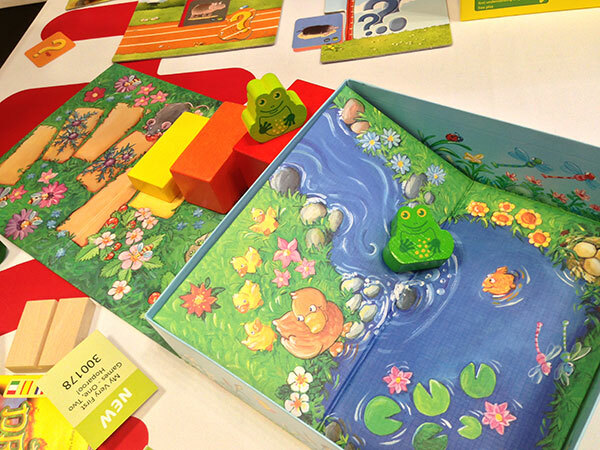 A game for 5+, retailing for $14.